RUSH: Okay. So it might not have been money laundering with the shenanigans of Hillary and the DNC, but what about Uranium One? I wonder how all of these people that think Hillary Clinton is a goddess, God’s gift… I wonder how they’re feeling now. They probably don’t care. “Whatever it took! If we had a cheat the old codger, Sanders? So what! If we had to rig it? So what?” It’s probably the way they think. I have a fascinating little story here. Yes, here it is. Now, there’s one thing that I need to point out here, folks. Why was the Democrat National Committee broke? (interruption) Way to go, Mr. Snerdley, with the memory recall instantaneously. The Democrat National Committee, in 2014, was broke. Now, who ran the Democrat Party in 2014? Hint: It’s not the chairperson of the DNC. Whenever the president of the United States… Well, the president runs his party. In this case, Obama is the head of the Democrat Party. George W. Bush was the head of the Republican Party ’cause he appoints everybody in these positions. Now, Donna Brazile in her book acknowledges that the Democrat National Committee was broke and in debt $20 million because of neglect by President Barack Obama. It’s right there in her book. Somehow, it is these people that everybody wants to run our health care system? It’s these people that everybody wants to run every other government agency and operation? You know why the DNC was broke? It’s because Obama didn’t care about it. He didn’t think the DNC had anything to do with his success. He did. He’s the guy that campaigned. He’s the guy that raised the money. Why should they get it? And because they were $20 million in debt, it was ripe for a takeover. And Mrs. Clinton — who, as a Clinton, has gazillions of dollars — was able to fork over $20 million to bail it out in exchange for taking control. While Obama was president, Hillary Clinton wrests away control of the DNC. Fine with him, I’m sure. He didn’t care. Do you remember stories…? Where was the Democrat convention 2012? Is that the one that was in Charlotte, North Carolina? I think to this day there are some vendors who still haven’t been paid. The Democrats are kind of like rich people; they never think they have to pay the bill. It’s such an honor doing business with Democrats, they don’t have to pay the bill. They are notoriously slow payers. They don’t… (interruption) What do you mean, “rich people”? I’m telling you, this is what the Democrats — well, some. You know, Pablo Picasso, when he wrote a check he knew nobody would ever cash it because that was his autograph right there. You know Aristotle Onassis very seldom paid the AMEX bill. What are they gonna do, take the card away from him? They’d rather him be seen using it all over the world. These people don’t pay the bills. It’s only us suckers that pay the bills! Democrats don’t pay their bills! They were $20 million in debt despite all the fund-raising that was going on. Most of that Obama was in charge of and largely controlling himself, and he wasn’t sharing much, if any of it, with the Democrat National Committee. So they’re massively in debt. I don’t think that anybody should ever, ever forget these kinds of things. Now, let’s run through some things here just to put all this in perspective. Donna Brazile’s self-serving book called Hacks has now stepped all over Hillary’s self-serving book called, What Happened. Brazile’s book ought to be called, What Really Happened. Hillary’s came out first: What Happened. Brazile: What Really Happened. Donna Brazile is claiming to be a victim of poor leadership (Barack Obama), poor management (Debbie “Blabbermouth” Schultz), and crooked deals (Hillary Clinton). Donna Brazile has set herself up as a completely innocent and shocked victim over what she saw when they named her the head of the DNC. She saw a president who had engaged in neglect; Debbie “Blabbermouth” Schultz, who can’t raise a dime and doesn’t care to — according to Brazile — and, of course, crooked deals with Hillary. Meanwhile, there is a real victim here of flat-out corruption, and that’s Bernie Sanders. The real victim is Bernie Sanders, a victim of flat-out corruption from the Democrat National Committee, from Debbie “Blabbermouth” Schultz and Hillary Rodham Clinton. Even after all of this — even today, even after all of this — when you go talk to Crazy Bernie about this his response is, “Donald Trump is the enemy.” These people do not break ranks. Except that Donna Brazile is. Hillary Clinton is right now out trying to make millions of dollars pretending that she was the victim in 2016. So it’s funny. It was the phony victim who paid for a phony dossier created with the help of Russian agents to take out Donald Trump! Hillary cheated Bernie Sanders out of a fair shot at the Democrat nomination and tried to smear Donald Trump out of the presidency. Yet she somehow is the victim? And she’s running around milking it and playing it for all its worth. The title of her book is rooted in victimology. (sobbing) “What happened? What happened? How did they take it away from me? They stole it from me. It isn’t fair! First 2008 and now this?” And let’s not forget the Never Trumpers here, folks. A comment for our principled friends: Hillary Clinton will cheat anyone, anytime, anywhere. Remember, there were Never Trumpers on our side who preferred this woman to be elected president over Trump. There were Never Trumpers among us who know full well the full-fledged corruption and walking scandal and dishonesty that is the Clintons, and these people on our side preferred her to our party winning. Hillary and Bill Clinton are perhaps the two most corrupt people to have ever run for the presidency. A President Hillary Clinton was going to cover up her crimes and Barack Obama’s, and you know the list of things. And they would have continued to go after Donald Trump even if he had lost, to try to teach every other outsider a lesson: “Don’t try this yourself.” That’s why I’m serious. You know, I think I know the answer, but what do all of these Hillary Clinton devotees think now? And remember this: It could be over half of voters in the Democrat Party actually wanted Bernie, and they were a vocal lot. They were an engaged, energetic bunch. Crazy Bernie’s rallies were the closest thing to Trump rallies the Democrats had. Hillary’s rallies were nonexistent. She barely did them. Hardly anybody showed up and there was no energy. But Crazy Bernie? He had his young people that prefer socialism and communism, and they were showing up in droves. What do they think? They’ve been suspicious of this from the middle of those primaries. Crazy Bernie’s voters believed from the get-go the game was rigged against him, and now they know that it was. What does that mean for the Democrat Party going forward? They’re gonna need a fall guy, folks. Brazile is making sure she’s not gonna be the fall the guy. Hillary can’t be the fall guy because Hillary’s already fallen. Using Hillary Clinton as a fall guy doesn’t advance things. You’re gonna have to take somebody that’s at the DNC now and lop their head off. You’re gonna have to take somebody at the DNC right now and can ’em — make a spectacle of ’em or something — to try to paint the picture that you are fixing the problem. Now, who runs the DNC right now? That lunatic Obama holdover from the cabinet, the Department of Labor, this Tom Perez guy, who’s a genuine unhinged, hate-filled extremist, is running the DNC. He’s the guy in charge of the new Democrat policy that they gotta say the F-word at every rally, and they gotta curse, and they gotta be profane because that’s what they think voters want to hear. They think voters are so angry and so livid at Trump that that’s how you reach ’em. You drop F-bombs on ’em, and you drop all other kinds of profanity. This guy is in charge of that policy. This guy is gonna be made the fall guy. You watch. They’ve gotta have a fall guy. If this Brazile thing, if it settles in — remember, now, the three nightly newscasts have yet to cover the story. Well, they could go after Blabbermouth, but she’s gone. They got rid of her. I mean, if you go out and punish Blabbermouth, you still haven’t touched the current apparatus of the DNC. Remember, this is for appearances. It’s not that Perez did anything wrong; it’s that somebody’s gonna have to fall on the sword to make it look like they’re cleaning house. Well, they fired the top fundraiser and they made sure that everybody knew the top fundraiser was incompetent and worthless at the same time. That’s exactly what I mean. She was the first fall guy. Although she had nothing to do with any of this. But they need fall guys to draw attention away from the things Brazile is exposing. RUSH: Here’s Andrea in Oklahoma City. Great to have you with us. How be it? CALLER: Hi, Rush. So, hey, is there anyone taking bets on whether Donna Brazile makes it out of this or if the Clintons take her out. And if she does make it through intact, does that mean it’s safe for other people to come out with truths about the Clinton dealings over the decades? 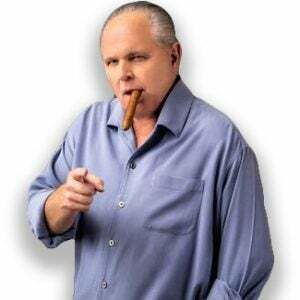 RUSH: (laughing) I think you’re asking me what I think you’re asking me. You know, this the kind of dovetails in an observation I made earlier that from the moment the Clintons set foot in the White House to the present, there hasn’t been a traitor. There hasn’t been a tell-all book written. Nobody’s gone on TV to tell what really went on in the Clinton White House. I mean, there have been a couple of FBI agents or Secret Service agents that wrote stories Hillary would throw ashtrays at Bill and, you know, crack the American flag over the heads of Marines and so forth, but, I mean, no real tell-all. This Brazile thing is the first. Up ’til now, we had to use intelligence guided by experience. But this is somebody up close, in tight and personal with the Clintons who is throwing her under the bus and to a certain extent Obama. And so Andrea wants to know if Brazile is gonna live through this. CALLER: Are the floodgates open? RUSH: (laughing) Well, you know, your second observation’s right on the money. If she does survive this, it might open the floodgates. I mean, will they reactivate the bimbo eruptions and try to turn on Brazile — look, Andrea, it’s not a bad question if it’s restrained somewhat. It’s a very good question if you consider that there might be action taken against. And I’m not talking about what she’s alluding to here. Let’s not go there. Let’s not go the Vince Foster route here. Let’s just say that the Clintons decide they can’t let this stand and they have to come up with some of their own dirt to throw back at Brazile in order to discredit some of this. That is a good question. Is Hillary just gonna sit there? Is Bill just gonna — is James Carville or Paul Begala and George Stephanopoulos, are they just gonna sit there and let this go by untouched? Sidney Blumenthal, one of Hillary’s enforcers. But the old Clinton war room — there’s a lot riding on this. These people are getting up there in age. We’re getting ready to the point where lasting legacies and images are created. Do you think Hillary wants one of the last things in her public life to be how she cheated and hired the Russians and rigged an election against an old man? Now that I think about it, they might be proud of that. My guess is they don’t want that. But you know where Bill’s hanging out most of the time? His library and massage parlor. Bill’s in Little Rock most of the time, from what I’m told. He’s flying around world charities and so forth, Kevin Spacey. But that’s a great question, whether they’re gonna retaliate against Brazile. And if they could, what the reaction to that will be. And look, Debbie “Blabbermouth” Schultz has been implicated here too. It’d be interested to see if there is any retaliation from any sector against Brazile. Or somebody steps forward and says, “She’s not accurate about that. She’s making this up. This isn’t true. This is horrible” and start shifting the blame. “What is she trying to cover up? What has she done that everybody’s trying to cover up and see to it that they don’t find out about?” That kind of stuff starts and I wouldn’t be surprised. You think the Clintons are just gonna sit there and take this, Mr. Snerdley? What does your gut tell you? Gonna come back at her somehow. Hillary can say, “She may have sent me the debate questions, but they were fake. She was trying to screw me up, but I was too smart for her.” You know, things like that.